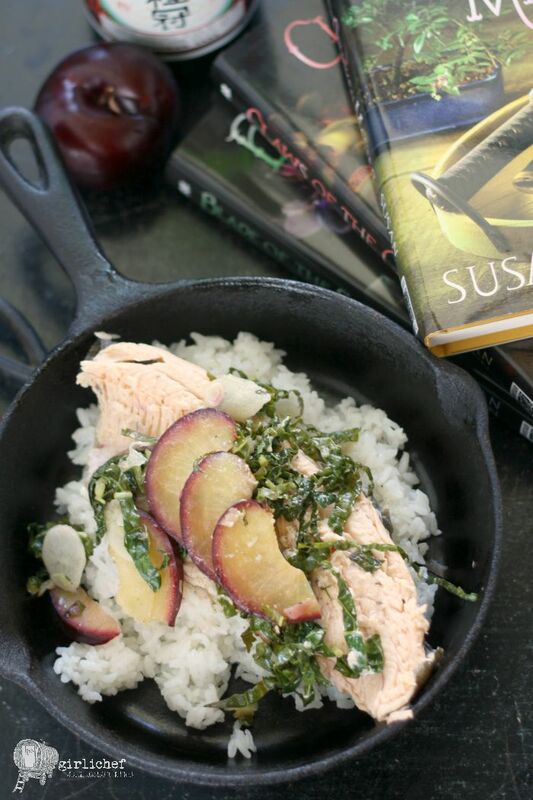 I'm so excited to be hosting a tour stop for Susan Spann's latest release in her Shinobi Mystery series today. I'll admit, it was initially the title that drew me in: Flask of the Drunken Master. I hadn't read (or even heard of) the books before, but I'm a huge kung-fu fan, and Drunken Master is one of my favorite kung-fu flicks, so I couldn't wait to read the book. Now, there's actually no kung-fu involved in the book, and it's set in Japan, not China...fortunately, that didn't stop me from enjoying every minute of it! So, I mentioned that this book is actually part of a series; it's book three. I ordered the first two books in the series with the intention of reading them before this one, but time got away from me and I didn't get the chance. Now that I've read Flask of the Drunken Master, I can't wait to go back and get caught up with the first two books, but my experience wasn't lacking for not having read them already. It can stand on it's own if you want to dive right in. Flask is a mystery set in Japan in the year 1565. Our main characters are the Hiro, a translator who, unbeknownst to most, is actually a shibobi (ninja), and Portuguese Jesuit Father Mateo. Together they are working to prove sake brewer Ginjiro innocent of the crime of murder, and find the real killer before he is executed for the crime. With an intriguing storyline, a vividly described setting, and a lively cast of characters, Flask of the Drunken Master held me captive from page one. Like a good mystery, the story took twists and turns, and revealed secrets that begged of possible guilt and innocence. Best of all, it wasn't predictable. 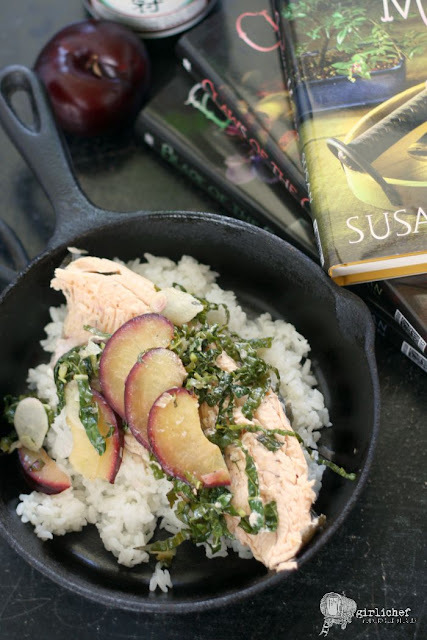 This is a great read for mystery lovers and fans of Japanese culture—plus it feeds the foodie in me. As he hoped, the chewy noodles had just the right combination of onions, fish, and savory broth. Braziers filling the air with the "scented sizzle of grilling meat", the "tantalizing aroma of grilling fish", fresh buns, sweet rice balls, "the aroma of plump, high-quality rice", and of course (it is Japan, after all) tea. So many things to be inspired by. Instead of drawing my idea from a single passage or idea, I used the book as a whole for my inspiration this time around. I knew that sake was a must in any dish I chose. And I couldn't get the thought of fish out of my head. I inhaled the scent of the recently grilled fish in the air of the home right along with Hiro. I hungrily eyed the fish right alongside Luis, the Portuguese merchant that Hiro and Father Mateo shared a house with. The merchant surveyed the roasted fish and heaping bowl of rice with hungry eyes. Sake and fish it was. However, I added one more piece to the puzzle. Luis is described as wearing a lace-necked doublet in an uncomplimentary shade of purple with dark brown leggings that stretched over his meaty thighs. Together, the garments put Hiro in mind of a lace-crowned plum swollen far too large for its twig. Plums! 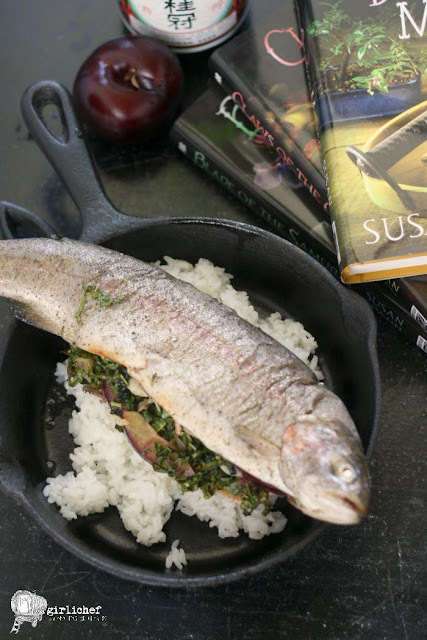 Ana, the housekeeper, picked up fish from the fishmonger, and in my mind, I imagined that she roasted it whole. So, I combined plums with ribbons of dark greens I had in the crisper (if you can find some Japanese greens, use those, otherwise go with spinach or dinosaur kale), paper-thin slices of pickled ginger, and a scallion...then tossed it all with sake and seasoning...and stuffed it inside the whole fish before roasting them. And of course, I served it on a mound of rice. Rainbow trout is stuffed with plums, greens, pickled ginger, and daikon radish, then scented with sake in this whole roasted fish recipe. 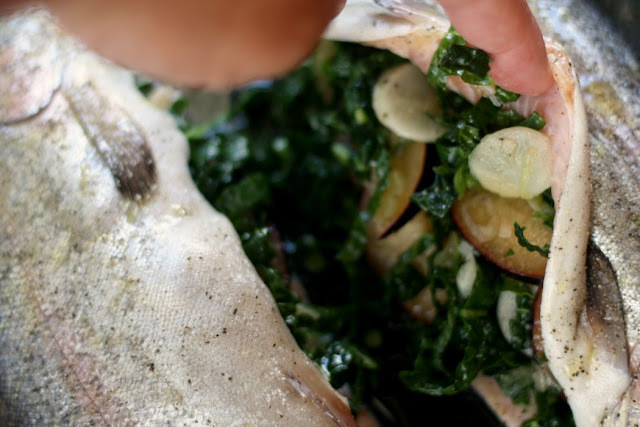 Preheat oven to 400° F. Line a baking sheet with foil or parchment paper or have a 12" cast-iron skillet ready. Gently toss all of the ingredients for the stuffing together in a small bowl. 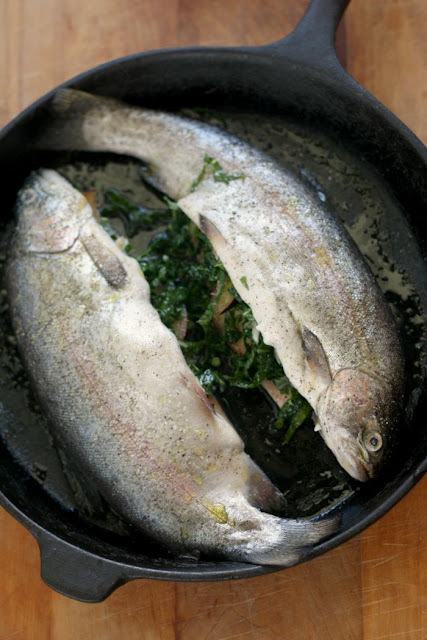 Sprinkle the inside of the fish with salt and pepper, then drizzle with a little olive oil. Stuff each fish with half of the stuff and set on the baking sheet or pan (be sure to pour any extra liquid in the bowl into the fish). Drizzle with a little more olive oil and sprinkle with another pinch of salt and pepper. Slide baking sheet into preheated oven and bake for ~20 minutes, or until the flesh flakes easily. 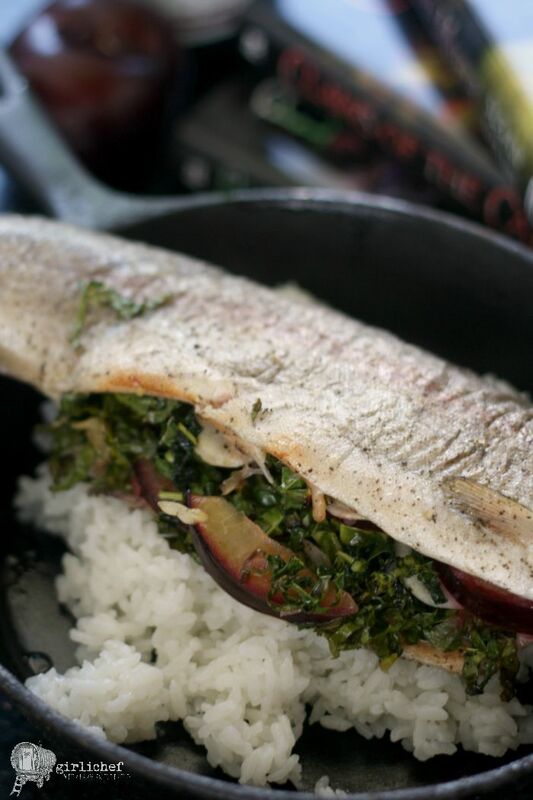 Serve fish and veggies over rice. "foodie" read: Not specifically, but it does contain some hunger-inducing descriptions of food and plenty of sake! random excerpt: "He won't release me." Suke smiled cheerfully. "He'll order me hanged and display my head on a pole as a warning to others. I don't mind. Death will free me to enter my next incarnation. This time, I hope I return as a cat." "A cat." Hiro had to ask. "Why do you want to become a cat?" 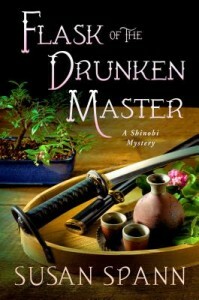 synopsis: August 1565: When a rival artisan turns up dead outside Ginjiro’s brewery, and all the evidence implicates the brewer, master ninja Hiro Hattori and Portuguese Jesuit Father Mateo must find the killer before the magistrate executes Ginjiro and seizes the brewery, leaving his wife and daughter destitute. A missing merchant, a vicious debt collector, and a female moneylender join Ginjiro and the victim’s spendthrift son on the suspect list. But with Kyoto on alert in the wake of the shogun’s recent death, a rival shinobi on the prowl, and samurai threatening Hiro and Father Mateo at every turn, Ginjiro’s life is not the only one in danger. about the author: Susan Spann is a transactional publishing attorney and the author of the Shinobi Mysteries, featuring ninja detective Hiro Hattori and his Portuguese Jesuit sidekick, Father Mateo. Her debut novel, CLAWS OF THE CAT (Minotaur Books, 2013), was named a Library Journal Mystery Debut of the Month. Susan has a degree in Asian Studies from Tufts University, where she studied Chinese and Japanese language, history, and culture. Her hobbies include cooking, traditional archery, martial arts, and horseback riding. She lives in northern California with her husband, son, two cats, and an aquarium full of seahorses. To enter, simply answer the following question in the comments section of this post. Be sure to verify your entry in the rafflecopter, after which extra entries will open up! What draws you to this book: mystery, ninjas, sake, Japanese culture, or all of the above? This giveaway is open to residents of the USA and Canada that are at least 18 years of age (complete terms and conditions can be found inside the rafflecopter widget). Follow the Shinobi Mysteries TLC Book Tour!